Israel is due to host the European Under-21 championship in 2013. PFA President Jibril Rajoub wrote to Uefa to express concern about three Palestinian players who are being held in Israel without charge. One of them, midfielder Mahmoud al-Sarsak, is on hunger strike. Mr Sarsak, 25, is one of a handful of Palestinian prisoners who have rejected a deal that ended a mass hunger strike on 14 May. 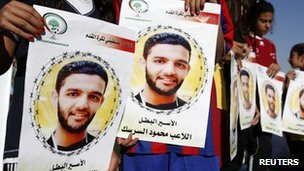 He has been held for three years under Israel's "Unlawful Combatants Law", which allows for Palestinians from Gaza to be detained for an unlimited time without charge or trial. Last week, human rights groups warned that the former star player was close to death after more than 80 days without food. Mr Rajoub wrote to Uefa President Michel Platini to say that Israel's government is in "direct violation" of regulations set out by Fifa, football's world governing body . "For athletes in Palestine, there is no real freedom of movement and the risks of being detained or even killed are always looming before their eyes," he said in the letter. Israel, however, says Mr Sarsak is being held because he is a threat. "Mr Sarsak was arrested on the basis of information pointing to his involvement in military activities of the Palestinian Islamic Jihad (PIJ) in Rafah. This involvement included the planting of explosive devices, recruiting and training terrorist cells, as well as maintaining contacts with PIJ's militant leaders," said Israeli government official Amir Ofek. "Describing him as a 'young Palestinian footballer' is insulting to footballers." In addition to Mr Sarsak, Olympic squad goalkeeper Omar Abu Rois and Ramallah player Mohammed Nimr are being held in Israel without trial. On Tuesday, Fifa expressed its concern over the fate of Mr Sarsak and asked Israel's football association to take action.